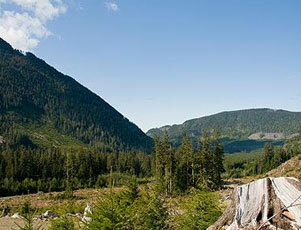 The most challenging and physically demanding hunt we offer is the Mountain Goats that inhabit Knight Inlet. 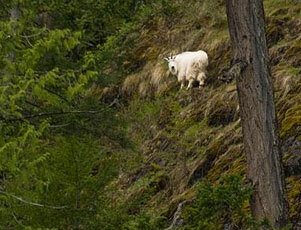 Our area has a healthy population of mountain goats with virtually no hunting pressure. Many of the goats in these high mountain passes and alpine lakes live out their lives and never see man. We offer remote and exciting hunts for this monarch of the mountains. Our Mountain Goat season runs from September 10th through November 30th. Depending upon weather, hunts will be planned for the latter part of September and early part of October to ensure excellent hide quality. Generally, weather deteriorates into increased rain, fog, and wind as the season progresses. Your mountain goat hunting adventure starts in Campbell River, British Columbia where you board a float plane for the high alpine lakes of Knight Inlet. Upon landing at the base camp, preparations are made for the 800' to 1000' climb in elevation to the first of several spike camps. For the next 7 days you will be on top of the world making your way around the mountains glassing, spotting and stalking trophy class billies. Physical and mental conditioning is very important for this hunt. 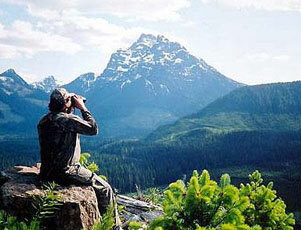 Trophy West Guide Outfitters has the experience to make this a safe, successful and enjoyable hunt. Harvesting these majestic animals will take considerable effort but the reward at the end of the hunt will be well worth it. We request that you limit the weight of your personal gear to 1 or 2 medium size waterproof duffle bags not to exceed a total weight of 50 lbs. To the left (What To Bring) is a suggested list sufficient for a 7 to 10 day hunt. Weight is a critical element as transportation from Campbell River to base camp will be in light bush planes with limited baggage space.